September 6, 2010 in Retro finds! | Be the first to comment! Yes, it’s a bit of an odd thing to write an entire post about. Normally, I don’t give much of a thought to magazine racks, but a recent visit to the local antique store changed that. As usual, I found something that I liked, but didn’t buy, because I wanted to “think about it.” Then I went home and thought about it and realized two hours after the store closed that yeah, I wanted it. Too late! My adventure will have to be continued another day. Truthfully, it wasn’t that I wasn’t sure if I wanted the rack, for I liked it well enough. But the top part of the rack has a shelf with a hole in it, designed to hold an ash tray (of course). The original ash tray had been replaced with a really ugly ’70s one, and I hesitated in buying the rack until I could be positive that I could find a replacement ash tray. Etsy to the rescue! I found several that I think might work. I just have to confirm the measurements. Almost everything is identical — except for the lines on the side of the rack. What caught my eye to the rack in the local store was the way the lines started off wider apart at the top, then converged in a near-V formation toward the bottom. Hellooooo, atomic lines! This one has everything but that. So I’ve been spending some time on Etsy, messaging random sellers with requests for the specific dimensions of their ash trays. There’s a chance they think I’m nutty, and I’m OK with that. 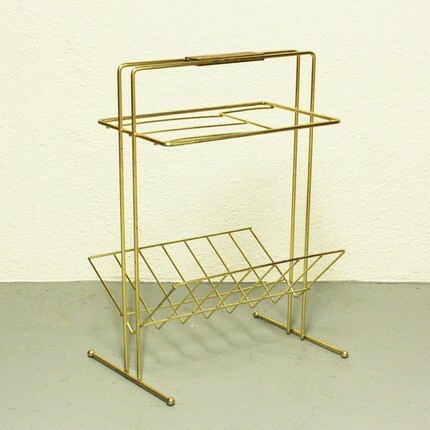 But hey — if I can find a replacement and have this rack sitting in my living room, I think it’d be a nifty thing. This rack may already be affecting my choice of adjectives. If you have fallen in love with this little magazine rack, you can have the one on Etsy. Happy ash tray hunting! Is there such a thing as too much starburst?